Spring is presenting itself on our mountain after a very generous winter. Creeks are running and ground water tables are up, so perhaps our mixed-conifer forest will be able to fight off some of the various bark-beetle attacks. Spring is the time to get back to the fire abatement measures that will protect your home or cabin from a wildland fire. With plentiful rain and snow, we get a plentiful annual grass crop, which is easily ignited and can cause a rapid rate of fire spread. Also, there is the constant needle and leaf cast from our forest. A fire-resistant roof (cement shake, tile or composition) can be compromised by leaf litter and pine needles in roof valleys or rain gutters. Unfortunately every year, somewhere in California, we see homes burn down. The cause was not the flames from a wildland fire, but that the burning embers landing in flammable material on roofs and decks torched the structure. 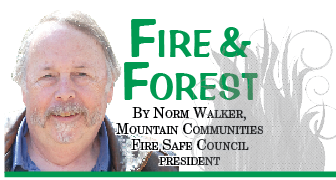 The Mountain Communities Fire Safe Council stands ready to help families get their abatement done and comply with Public Resources Code 4291 (State of California fire abatement standards). We are a 501(c)(3), a nonprofit organization. We have two paid members: Executive Director Edwina Scott and Project Manager Pat Boss. Our nine-member Board of Directors is all volunteer, as is our working group, the Woodies (19 members). MCFSC is funded through grants from the U.S. Forest Service, Cal Fire and Riverside County Fire, and donations from the public and civic groups. The grants are 65/35 grants so the home owner only pays 35 percent of the total abatement cost. One hundred percent of the grant monies go to contractors who do the actual abatement. The homeowners’ 35 percent and the public donations go to public education (quarterly newsletter and public functions) and the operating costs of the MCFSC. On behalf of the MCFSC, thank you to all those who had their wood-shake shingle roofs replaced with fire-resistant materials through the FEMA grant managed by MCFSC and Riverside County OES. “Hardening” of your buildings keeps them safer and helps to protect the community at large. The annual grass crop mentioned above is curing at the bottom of the Hill already and soon will be cured up here. Let us all contribute to a large pile of green waste at the transfer station. A phone call to us at 951-659-6208 will get you started.